New York Rangers President and General Manager Glen Sather announced today that the club has agreed to terms with free agent forward Micheal Haley. Haley, 26, has registered two goals and one assist, along with 151 penalty minutes in 43 career regular season games over three seasons with the New York Islanders. Last season, he ranked second on the Islanders with seven fighting majors despite only skating in 14 games. He made his NHL debut on April 10, 2010, at New Jersey, and tallied his first NHL point with a goal on February 11, 2011, against Pittsburgh. Haley spent the majority of last season with the Bridgeport Sound Tigers of the American Hockey League (AHL), registering 15 goals and 10 assists for 25 points, along with 125 penalty minutes in 51 games. He established AHL career-highs in goals, points, shots on goal (101), and plus/minus rating (plus-four). 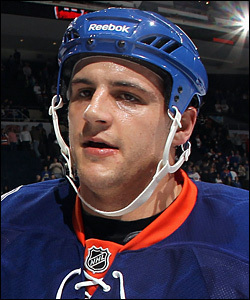 Micheal Haley managed to reach the NHL despite never having been drafted and has seen action in parts of the past three seasons with the Islanders. Haley tied for fourth on the team in goals, ranked 10th in points and led Bridgeport in penalty minutes. He notched his first career hat trick on February 11 against Springfield, capping off a four-game point streak that began on January 28 at Syracuse (five goals, two assists over the span). Haley posted six multi-point performances, including four multi-goal efforts. In addition, he skated in three playoff contests with Bridgeport. The 5-11, 205-pounder has skated in 247 career AHL games over five seasons with Bridgeport, registering 40 goals and 33 assists for 73 points, along with 639 penalty minutes. He established a career-high with 10 assists and surpassed the 20-point mark for the first time in his AHL career with 22 points in 2010-11. He ranked ninth on Bridgeport in points, seventh in goals (12) and first in penalty minutes (144) that season. In 2009-10, he ranked 13th in the AHL with a career-high, 196 penalty minutes. Haley notched a goal while making his AHL debut on December 8, 2007, at Springfield. In addition, he has tallied one goal in 11 career AHL playoff contests with Bridgeport. The Guelph, Ontario native was originally signed by the NY Islanders as an undrafted free agent on May 19, 2008.